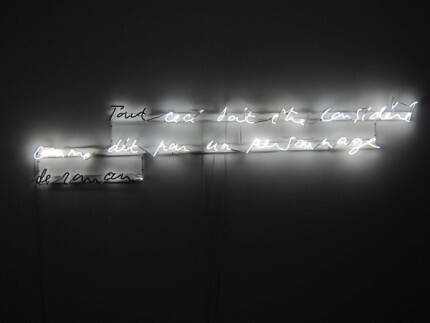 Vincent Meessen, Forgery, neon, 2011. Collection FRAC Aquitaine. Seoul Museum of Art has prepared a large-scale photography exhibition The Family of the Invisibles to commemorate 130 years of Korean-French diplomatic ties. Selected from the collections of two globally recognized institutions, the Centre national des arts plastiques(CNAP) and Fonds régional d’art contemporain Aquitaine (Frac Aquitaine), the exhibition presents 210 contemporary photographs taken after the 1950s. The Family of the Invisibles commemorates the 100th anniversary of the birth of the French philosopher Roland Barthes (1915-1980). The exhibition has its anchor in the theory of photography in Camera Lucida, an iconic book written by Barthes which had a significant influence on photography, contemporary art, cultural discourse, and epistemology. Based on Barthes’ idea which paid attention to invisible and marginalized beings, the exhibition criticizes the notion of an imaginary community of mankind, which was previously presented in The Family of Man held at the MoMA in 1955. The exhibition also deconstructs mythical elements embedded in contemporary society.